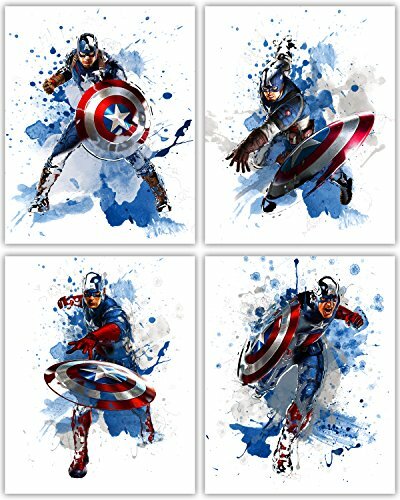 Tangible Prints is excited to offer this action-packed, bright and bold collection of Captain America prints. Rejected by the army because of his frail condition and underdeveloped body, Steve Rogers submits to medical experiments and becomes a "super soldier" -- Captain America. These are the basic facts of Captain America's origins but it is his character traits -- honesty, courage, integrity, loyalty and humility -- which have rung true in readers hearts and made him such a loved and long-lasting character. Inspired by these values our artists at Tangible Prints have created these bold images in vibrant patriotic red, white and blue. We hope you love them as much as we do. At Tangible Prints the Customer Always Comes First! Our photos are developed on premium grade paper. All of our photographs are processed and fulfilled by Amazon. FREE Two-Day shipping with Amazon Prime!! If you have any questions about this product by Tangible Prints, contact us by completing and submitting the form below. If you are looking for a specif part number, please include it with your message.